Every once in a while, people come across this silly little blog or actually come to the house and visit, and they ask about the cats. Well, they don’t ask about the cats per se, but they ask about the names. Everyone knows that cat people have a thing about odd names, but people who know me know that I have a thing for reasonably obscure ones, too. This is a deliberate effort to confuse visitors, so they don’t stick around long enough to discover that I don’t name the plants. Believe it or not, it works remarkably well. The only problem is that they continue to ask about the cats, wondering “Why would you choose those names?” When they realize that I used to be a professional writer before I came to my senses, they simply smile and nod, instead of screaming and running for the door. Not that I mind their screaming and running, but the Czarina has issues with this when her parents come over: they have enough of a problem with the life-sized Nanotyrannus head hanging over the toilet in the spare bathroom. As it turns out, a run on a used bookstore week before last dredged up some beauties, giving me the opportunity to illustrate the examples. Well, that and torment the increasingly more sporadic visitors when they come by. In the case of Cadigan, she actually had things pretty easy. Her story actually starts twenty years before she was born, when a then-girlfriend came up and told me “You HAVE to read this book.” At the time, I got a lot of that, and was already starting to blanch over the word “cyberpunk” being thrown around about it. At the time, the word was less a description of a certain subgenre of science fiction involving situations where technology outstrips ethics and becoming more of a marketing catchphrase, like “steampunk” today. Worse, by 1992, the subgenre itself had gone from being more punk to more cyber, attracting both writers and readers with an unhealthy obsession with downloading their personalities into computers and leave the meat behind because, as I wrote later, “they couldn’t get laid in Tijuana with a jockstrap full of $100 bills.” (Yeah, I was a little angry back in the early Nineties.) After trying my best to plow through many of the more recommended books at the time, and realizing that the people who read Bruce Sterling novels do so because they can’t handle the depth of characterization in Microsoft operation manuals, I shuddered and gulped, and took a chance on her recommendation. And that book damaged my fragile little mind. For those who know Pat Cadigan, you already understand why I named my little orange cat after her. For those who don’t, let’s just say that they both have the same curiosity and general attitude about life. Science fiction enthusiasts talk about how Arthur C. Clarke developed the idea of the geosynchronous communications satellite but failed to patent it, but if Pat had the time back in the early Nineties to file patents on many of the ideas in her novel Synners alone, she’d own half of the planet right now. Bill Gates would be her personal doormat, and Steve Ballmer would dance every time she shot at his feet. Just tell yourself, tell yourself, that you could look into the eyes of a kitten with exactly the same expression that Pat gets when she’s on a roll and not think of naming that kitten after her? And the third book? Well, we’ve run out of cats, but this one had particular significance back around 1997 when it came out. Not only did I have a ginger cat named “Jones” at the time, but I also had a savannah monitor at the time named “Steadman”. When friends would ask for that story, and they learned very rapidly not to ask again, for anything, I just told them the tale of the baby lizard I brought home for my birthday in 1997. The hatchling lizard that went into a large cage, loosened his bowels for maximum effect, and very promptly managed to make the inside resemble a Ralph Steadman painting. That was the day, after removing him from said cage and having to climb inside to clean the filth he’d managed to spatter on the ceiling, that I first coined the phrase “a stench that could burn the nose hairs out of a dead nun,” and he rarely disappointed me in new opportunities to use it. Most savannah monitors tend toward personalities that blend David Bowie and Sid Vicious, but Steadman was pure G.G. Allin. In that case, he was the perfect personification of my writing career at that time. That about sums it up at the time, although the Czarina makes vague noises about another cat, and I’ve made my choice of next pet very plain. With the next cat, the deal is that s/he who pays the adoption fee gets to name the beast, so I suspect she’s saving her pennies in anticipation. Free Story Idea, One Inside This Box! Posted on August 23, 2013 | Comments Off on Free Story Idea, One Inside This Box! It’s no secret that, over a decade back, I used to be a science fiction writer. 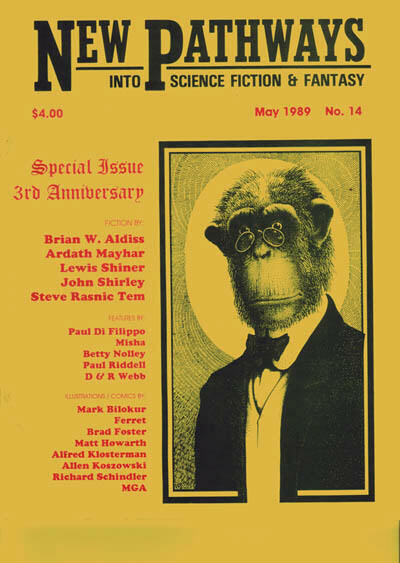 No, scratch that: I was a science fiction essayist. Never wrote any fiction that came close to being published, but I wrote a lot about the genre and subjects related to it. It started out with the lowest of the low, film reviews for long-dead zines, but then I migrated to science essays and articles and everything really went crazy. That’s when I ran into a fundamental dichotomy in science fiction: while everyone keeps emphasizing the “science” in the name, it’s an overemphasis on what would be considered “applied science” in the Dewey Decimal System. Engineering and mechanics are the main sciences observed and utilized in much SF, particularly what’s commonly categorized as “hard science fiction,” and for someone like me with an ongoing fascination with the biological sciences, the reality was a lot more engrossing than the fiction. And that’s one of the problems with far too much science fiction: authors who spend months and years fussing about the physics and the tech being used by an alien species, who even write up scientific papers based on the research they conducted, and their biology begins and ends with what they half-remember from high school. With the exception of Robert Sawyer, you don’t see too many hard SF writers with extensive experience in biology or palaeontology. (You do see quite a few horror writers with an extensive zoology and/or palaeo background, ranging from H.P. Lovecraft to Caitlin R. Kiernan, and I’m not sure why, but I’m not complaining.) It’s bad enough when you read stories where the characters and motivations are secondary to showing off some spiffy tech Big Think, but it’s particularly disappointing reading a novel where the details of a starship drive are worked out to eight decimal places, and the creators of that drive are tetrapods or arthropods with a slightly different number of fingers or eyes. I started walking away from the genre after realizing how real zoology was so much more fascinating than the fiction, and when I started studying botany, that’s when I started to run. The problem with this comes with remembering themes and concepts that were absolutely riveting to me three decades ago, but that leave much, well, everything to be desired. After a while, it’s a matter of reverse-engineering a mediocre (to me) idea and revving it up a bit. That’s a standard trope in writer’s guides: if you’re inspired to write because you read someone else’s story and you know you can do better, then do so. Or, with those of us with no real interest in writing fiction, passing on the ideas to friends and cohorts and seeing what they do with it. And thus, supercharging a glimpse on a sidestory, it’s time to put a nitrous rig and V8 blower on a childhood favorite of mine, The Gentle Giants of Ganymede by the late James P. Hogan. To give the background to The Gentle Giants of Ganymede requires recapping the previous book in the series, Inherit the Stars, so hang on. The action starts in the near future, after humanity buils a significant presence on the moon. In the course of development, a crew discovered a spacesuited corpse in a hollow. The deceased, nicknamed “Charlie,” was human, but his corpse had been sitting in that lunar hollow for 50,000 years. In the course of trying to understand how a technologically advanced human ended up on the moon when all of Earth’s hominins were still in the Stone Age, a research team came across a derelict spacecraft buried in the ice on Ganymede, Jupiter’s largest moon. This ship dated from about 25 million years ago, and was operated by an obviously alien species therefore nicknamed “Ganymeans”. Not only was there the mystery of why the Ganymeans had crashed there, but the hold was full of preserved specimens of Earth animals from the Miocene, including some early apes. Our intrepid heroes learn that the Ganymeans were indigenous to Minerva, a planet that used to exist between Mars and Jupiter, and apparently transported terrestrial life to Minerva for unknown reasons. The Ganymeans left the solar system for equally unknown reasons, leaving those terrestrial animals to take over, and the early apes apparently evolved into Charlie’s people and later our own ancestors. But there’s more. Shortly after the brouhaha with Charlie and learning of humanity’s Minervan sidetrip, experimentation with pieces of the ship on Ganymede helps bring up a bit of cosmic flotsam. Namely, 25 million years before, a Ganymean starship left a world thousands of light-years away in a hurry as the world it was visiting went supernova. Because of the haste of the departure, the Shapieron left without any easy way to brake, and the ship spent twenty years subjective time slowing down by orbiting the whole of the solar system. Thanks to time dilation, 20 years went by outside while 25 million years went by outside the ship’s gravitational bubble. The Ganymeans pick up a transmission from a distress beacon activated by human techs, limp to Ganymede, discover that their homeworld is asteroidal debris between Mars and Jupiter, and then have to decide what to do from there. Now what does this have to do with botany? Hang on: I’m getting there. One of the main physical and psychological tropes of the Ganymeans is that they’re absolutely incapable of violence or aggression. The idea was that when vertebrate life developed on Minerva, it had to face much higher levels of carbon dioxide in the atmosphere than on Earth, and the early Minervan fish dealt with this by developing a dual circulatory system. One half of the system handled oxygen and nutrients, while the other processed and excreted carbon dioxide and other wastes. One group of these fish amped up the amount of waste in the secondary circulatory system, essentially leaving them poisonous. The immediate advantage was that carnivory never had a chance to get established in subsequent generations of Minervan vertebrates, as anything taking a bite out of a neighbor would die right then and there. The immediate disadvantage was that intermingling fluids from the two systems, such as with injuries, would kill the victim, too. Ergo, the ancestors of the Ganymeans evolved to be very careful and thorough, with cooperation instead of competition being a serious survival trait. Because of an absence of predators, Minervan lifeforms took on all sorts of odd traits and behaviors, on the assumption that they’d never learn fight-or-flight instincts. Even after the Ganymeans used genetic engineering to remove the need for the secondary system, they still kept those traits, allowing them to develop high technology and travel to the stars solely by their need to be of use to someone. Now, I’m not going to go into further detail on the story, or the Ganymeans’ trip to Earth, which they knew 25 million years before as “The Nightmare Planet” because of its indigenous carnivores. I will note that, as with a lot of genre writers, James Hogan made a lot of assumptions about how life might evolve on other worlds as compared to Earth. For instance, even though vertebrates are only a tiny contingent of multicellular life on Earth compared to arthropods, annelids, and cnidarians, the only animal life on Minerva seemed to be analogs to terrestrial vertebrates. No parallels to insects, worms, crustaceans, or chelicerates, either in the oceans or on land. Likewise, almost nothing is presented about Minervan plants: in the story, one scientist manages to isolate frozen indigenous seeds from debris in the ship on Ganymede, and amazingly gets these seeds to germinate. (Considering that background radiation on Earth after a few thousand years is the equivalent of a major nuclear strike, it’s hard enough to get date palm seeds from Masada to germinate. For similar seeds to survive 25 million years of radiation from Jupiter’s radiation belts, that ship on Ganymede must be a really special construct.) Other than the fact that they’re described as being nearly solid black to absorb the slightest bit of ambient light, they also appear to be identical to Earthly monocot or eudicot plants. No specializations, no particular traits to separate them from terrestrial plants: while it’s perfectly reasonable that similar structures would develop to take advantage of similar physical conditions, these plants are too much like their Earthly analogues. And here’s where the turbocharging comes in. Let’s work with the structure presented to us: Minerva has no other terrestrial life other than its vertebrates, these vertebrates are all poisonous to each other, the vertebrates are all vulnerable to even superficial bruises and cuts, and that they’re all eating the same plants. Now let’s see what happens. Firstly, as anyone who grew up on National Geographic specials will tell you, “herbivorous” does not mean “inoffensive”. Cape buffalo and elk and wombats are all herbivorous, and only fools get close enough for any of these to gore, trample, or bite. In Earth’s past, many herbivores may have been worse: many palaeontologists note that the real danger from a Triceratops wasn’t from its horns, but from its parrot beak. Hogan’s description of early Minervan forms included the need for armor or padding of some sort to fend off accidental injuries. That immediately gives a survival advantage, and also gradually remove any inhibitions on beastly behavior. Hippos, for instance, are highly territorial, and they’re even more likely to attack fellow herbivores such as elephants and Cape buffalo than they are to attack carnivores such as lions or crocodiles. With no prodding whatsoever, you could very easily see the Lystrosaurus of Minerva as a beast that combined the hippo’s easy-going herbivorous nature with the armor of a glyptodont or ankylosaur. Big armor-plated grumps with tail clubs would be dangerous enough on Earth, but with that dual circulatory system issue, one scrape on a spike or tusk or a bruise from a club would be lethal for anything trying to get their own share of fodder. It’s possible that the Ganymeans developed intelligence not out of a sense of ingrained altruism, but as a way to fight off the shellosaurs that left only the vegetation that they couldn’t eat. Plants also have other, more subtle defenses. Take a look at the capsicum oil in hot peppers or the hallucinogens in Datura stramonium, not to mention the urushiol oil in cashews and poison ivy. It’s not always necessary to kill a herbivore: sometimes, simply persuading it not to feed on a plant again is enough, whether that’s via blister agents or the world’s worst bad trip. In fact, based on Hogan’s original rules about the Ganymeans, plant consumption by Minervan animals would select for the production of hallucinogens of all sorts. If bruising yourself was a death sentence, noting that your buddy Fred decided to go galumphing down a hillside while tripping might be notice enough to a reasonable warning for any Minervan social animal. And here’s where it gets even better. As the quote at the beginning of this essay noted, plants don’t passively wait for animals to eat them. They themselves adapt and evolve, not just to prevent or forestall foraging but also to fill new ecological niches unused by others. The animals evolve in turn. As new mutations show up in one group of animals to process a particular toxin in a common plant, those animals become dominant, and the plants had best find a way, one way or another, to prevent their chromosomes from being removed from the gene pool. The development of intelligence just increases the pressure in certain ways: look at the number of human dishes, from masa to poi, that detoxify otherwise dangerous foods. Considering how we humans select varieties of plants for size, flavor, and ease in growing, it stands to reason that the Ganymean agricultural revolution would have run in parallel. That doesn’t just apply to food, either, as there’s no reason to believe that Ganymeans wouldn’t breed new plant varieties as spices, medicines, relaxants, and euphorics. One last part that hasn’t been considered is the complications that come from dead Ganymeans. Hogan’s novel mentioned that Ganymeans buried their dead, but no mention of how those bodies were processed by microbial and multicellular scavengers. It stands to reason that Minerva was just as rotten, pun intended, with microbes as Earth, and many wouldn’t care about the toxicity of that dual circulatory system. Likewise, nobody said anything about Minervan corpses remaining poisonous after death, and it’s perfectly reasonable to see certain otherwise completely herbivorous Minervan animals feeding on their dead for extra nutrients, in much the same way that red deer on the Isle of Rum feed on seabirds. However, and this goes straight into science fiction speculation here, what about the plants filling that niche? By way of example, lots of flowering plants produce seeds that stick to passing animals. Thistles, sandburrs, Devil’s claws: all of these take advantage of seeds that adhere to skin, fur, or clothing to spread them far past the plant’s immediate range. Others take advantage of animals to spread their seeds via dung: a prevailing theory holds that Capsicum peppers became as hot as they are to attract feeding birds, which pass the seeds through their gut, and repel mammals, which have guts that destroy the seeds. Osage oranges (Maclura pomifera) became extinct through most of their range probably because the various Pleistocene megafauna that ate their fruit and spread their seeds became extinct themselves. As with an earthly herbivore, a dead Minervan herbivore would be a huge source of available nutrients such as nitrogen and phosphorus, and the trick would be to use those nutrients before something else did. The problem most plants would face would be to have a way to have seeds on that body at the right time, under the right circumstances, so they took advantage of that treasure. In pure speculation, it’s not hard to picture a large group of Minervan plants with seeds that sprouted the moment it picked up byproducts of cell autolysis. These might be ones sticking to hair or armor, or they might be ones held internally. If Minervan animals had the equivalent of a gizzard, you’re looking at evolutionary pressures to produce seeds that could be used as gastroliths, especially in areas without decent rocks suitable for gizzard stones. If they didn’t, then one can picture any number of adaptations, such as seed coats that stuck (gently) to the intestinal wall, or various compounds that encourage the herbivores to keep coming back and eating more seeds. Either way, they hang on and wait, the Minervan critter drops dead, and within three or four days, the whole corpse is awash with new plant growth. Within a month, most of the easily utilizable nutrients have already been absorbed by root and rhizome, and the cycle continues. With all this in mind, one of the big plot points in The Gentle Giants of Ganymede is that the Ganymeans, for various reasons, left Minerva for a new world, and left Minerva to the descendants of the Earthly animals they’d previously picked up. The idea was that since the indigenous Minervan forms were all helpless herbivores, the introduced Terran carnivores fed on them until the herbivore populations managed to get established. 25 million years later, one group of transplanted apes developed sentience, developed civilization, developed high technology, blew up their adopted world, and then traveled to their original home to start over. Yeah, one big “what-if” story, but typical for science fiction. Consider, though, what probably would have happened after the Ganymeans left. The big terrestrial predators would be facing herbivores that knew perfectly well how to protect themselves from competition, and the terrestrial herbivores wouldn’t know what hit them. By the time they left, the Ganymeans would have left behind a flora where they ate Datura as mild relaxants, munched rhubarb leaves for salad, and filled baby bottles full of sriracha. By terrestrial standards, just about everything in the local gardens would be dangerously toxic or otherwise inedible, with seeds that latched onto intestinal walls and set off fatal bouts of peritonitis. And if that isn’t cheery enough, then consider that scientist who grew samples of Minervan plants in his lab: if he had any brains at all, he’d torch his whole lab rather than risk any samples getting back to Earth. One sprig of Minervan nightshade in a suitable climate, and you could kiss all of the indigenous flora goodbye, because nothing could compete with it in utilizing sunlight. Anyway, have fun with your stories. Between this and a good rereading of David Gerrold’s War Against The Chtorr novels, you should give gardeners nightmares for years. Comments Off on Free Story Idea, One Inside This Box! My friend Michael Hultquist is a bad man. No, I take that back. He’s a bad, bad, BAD man. Positively EVIL. The sort of guy who comes up behind exhausted parents and gives their children four shots of espresso and a puppy. I can say this, because he just let me know that he’s put together a whole site dedicated to jalapeno pepper recipes. I mean, he already has multiple books on chile pepper recipes out there, and now he has to offer MORE? The MONSTER. Very seriously, I’m glad of this for one big reason. I was first turned onto cream cheese-stuffed jalapenos via the Red Hot & Blue barbecue chain, where they were titled “Red Hot Chili Poppers”. Unfortunately, Red Hot & Blue removed them from the menu about four years ago, and repeated entreaties to bring them back have been unsuccessful. (I’ve forgiven them this trespass. The Walnut Hill location is still my choice for takeout just before screenings of The Walking Dead.) Now, though, NOW…it’s time to experiment with the basic idea. Even better, it’s time to try some of these with some of the best from the Chile Pepper Institute. I’ve said before that I was goth back when the term still referred to Germanic tribes overrunning the Roman Empire, and it shouldn’t be any surprise that I’ve had lots of interesting dark gardening ideas running through my head for the last six months or so since the Gothing Beauty fiasco. Well, it’s time to go back to causing more trouble: as of today, I became the official gardening columnist for Carpe Nocturne magazine. Since the publication schedule is significantly more active than that of GB, expect a lot more in the way of pertinent subjects, including looks at moon gardens, sources for statuary, and prehistoric plants. I suspect that there’s room in the gardening writing community for one Turner Van Blarcum; come to think of it, I may have to talk to Turner about designing some drastically different plant stands for the Carpe Nocturne crowd.